China's Premier Li Keqiang, center, shakes hands with his counterpart, Nguyen Xuan Phuc of Vietnam, Prayuth Chan-o-cha, prime minister of Thailand, Hun Sen of Cambodia, and Thongloun Sisolith of Laos, in Phnom Penh, Jan. 10, 2018. Leaders of the Mekong’s five downstream countries – Cambodia, Myanmar, Vietnam, Thailand and Laos – met with Chinese Premier Li Keqiang at the Peace Palace in Phnom Penh Wednesday for the second Lancang-Mekong Cooperative (LMC) leaders meeting. Keqiang, whose country sits at the top of the river known as the Lancang in Mandarin, said as permanent chairman of the newly minted LMC, China would deliver benefits to all members. “The cooperation on Mekong/Lancang is not merely paying lip service,” he said at press gathering in which questions were forbidden. “We talked about important principles in the meeting. We have to respect each other and consider each other with equality for common development,” he said. The actual submitted plan is so broad - covering almost every area of governance - that it is hard to point to a specific objective and no concrete steps appear to have been taken to address the growing number of man-made threats to the river system. Cambodian Prime Minister Hun Sen told reporters that centers intended to enhance water resource and environmental cooperation, as well as a global Mekong studies center, would be created, but he did not proffer any further details. Born in 2015 under the stewardship of Beijing, the LMC rivals the much older Mekong River Commission - to which China is only a dialogue partner and thus exempt from a requirement to present its dam proposals for discussion. While the MRC has been criticized by some as a largely toothless institution that has failed to safeguard the river and its dependents from harmful projects, there is nothing yet to suggest the LMC will fare any better. Seen by observers as another mechanism to extend Beijing’s sphere of influence over a region critical to leader Xi Jingping’s ‘One belt one road’ signature foreign policy, it stresses the values of regional peace and cooperation. China's Premier Li Keqiang gestures during the opening of the Lancang-Mekong Cooperation forum Leaders Meeting in Phnom Penh, Cambodia, Jan. 10, 2018. But relations between the six countries are historically anything but harmonious and a Chinese strategy of heavily damming the Mekong itself while funding similar projects downstream threatens to inflame tensions between the mutually dependent neighbors. The more than 4,000 kilometer river is home to the largest inland fishery in the world and feeds some 60 million people. Its powerful currents overwhelm the discharge of Cambodia’s Tonle Sap lake for six months a year, causing it to reverse flood – a remarkable process found nowhere else in the world that triggers an explosion of fish stocks and general biodiversity. From there it flows through Vietnam’s famously productive Mekong Delta region, where rising salinity and drought have wreaked havoc – leading China in 2016 to demonstrate its power by opening upstream flood gates to alleviate its neighbor’s pain. China has already built eight dams on the river while more than 20 others are under construction or being planned in Yunnan, Tibet and Qinghai - according to International Rivers. Laos, which plans to become the “battery of Asia” is currently constructing two highly controversial mainstream dams while preparing a third, ignoring its neighbor’s protests at the MRC, and has many more on the drawing board. Cambodia meanwhile has just completed another on a Mekong tributary – the Lower Se San II - with a large mainstream dam - the Sambor - planned as well. Maureen Harris, Southeast Asia director at International Rivers, said communities in Thailand and Laos had reported impacts from some of these dams for years, without any formal acknowledgement or redress. “During the past two decades, the dams upstream have drastically altered the river’s natural flood-drought cycle and blocked the transport of sediment, affecting ecosystems and fisheries downstream,” she said. 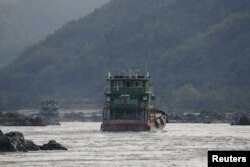 FILE - Chinese cargo ships sail on the Mekong river near the Golden Triangle at the border between Laos, Myanmar and Thailand March 1, 2016. A 2009 study by the Proceedings of the National Academy of Sciences of the United States of America found that if all 11 mainstream and 78 tributary dams planned on the river system were built, there would by a 51 percent decrease in the total fish biomass. China has pledged billions in financing for more projects on the Mekong through the LMC. Ian Baird, an associate professor of geography University Wisconsin-Madison who studies Mekong river fisheries, said while LMC members would happily take China’s money, gaining their long-term respect and cooperation is more complicated. 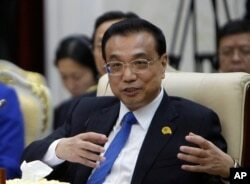 “I think time will tell how nimble China is in setting up a regional mechanism. Are they willing to give up enough power and say (influence) to the other countries that will make them really want to support this initiative,” he said. Chinese development forays into countries such as Laos were often portrayed as unstoppable where in reality a failure to appreciate the nuances of local power dynamics had led projects to fail, he noted. One of China’s more complicated regional objectives is to secure greater support for - or at least diminished opposition to - its claim over almost the entire South China Sea. Though LMC host Cambodia has pledged full support to China’s claim, others such as Vietnam remain bitterly opposed.